This Stockton Corporation Bus is pictured in the Wilson Street side of Exchange Place, this was the bus station for Middlesbrough Corporation buses, I was born and raised in Billingham and never knew that there was a Stockton bus that ran from Billingham to Middlesbrough, I know the “O” bus ran from Stockton to Middlesbrough, it is possible that this service ran from Billingham Stores and didn’t serve the estates north of the railway, our service was run by United and ran from Hartlepool to Eston Square. Exchange Place, Exchange Buildings and part of Marton Road disappeared when the A66 flyover road was built. Yes the 0 service was Ormesby to Stockton run by Middlesbrough corporation they ran on letters Stockton corporation ran on numbers like the 4 which was the Fairfield run from the High Street to Brookfield Road terminus. On 16th May 1967 I rushed home from school and caught the 11 bus to Middlesbrough for the vital promotion match Boro v Oxford. The Boro won 4 – 1 and returned to Division.2. An amazing night for football fans. A long walk back home afterwards. Stockton Council should erect a full size Bronze Statue of an “O bus” in the High Street as an happy reminder of the “Those Were the Days My Friends,” No one bothered with taxis then, they jumped on the “O bus,” and for pennies it could take you from (stop 1) Norton Green / Blackwell’s, to 2. Norton High St, Norton Launderette/ Norton Cinema, 3, the Brown Jug / Stockton Dog Track, 4. Portrack / Hills Works, 5. The Church with the pigeons on the roof and window sills and religious statues outside, 6. Pete’s Snack Bar (R.I.P Pete) 7. The High Street Shambles, Market, Empire & Odeon cinemas, 8. Parliament Street, and 9. Bridge Road Dole office and St Johns Crossing, 10. Thornaby Town Hall / Railway Station, 11. Five Lamps, 12. Harewood Arms, 13. Stockton Race Course / the Erimus, 14. Cleveland Park, 15. The Blind School, Newport Bridge, 16. Parliament Road, Middlesbrough,17.North Riding Infirmary Hospital / Cannon Street / Farrer Street Boxing Stadium, 18. Newport Road / Newhouses Corner, 19. Middlesbrough Town Hall, 20. Marton Road Corner, 21. North Ormesby Railway Crossing, 22. and.finally North Ormesby Market Place, turn around and go back back to Norton Green. Living on the Green in Thornaby, we used to get the 11 to go to visit at Albert Park. Quite a treat in the 1950s especially if we hired a ‘motor boat’ on the lake. I rode the number 11 bus regularly. In my days it was blue, not green. Ok, I’ll ask… the bus shows “Middlesbrough Exchange via Newport Bridge & Paddy’s Crossing”. I see there’s a Paddy’s Crossing bus stop on New Road, Billingham, but who was Paddy? and why does he have a bus stop named after him? Anyone? I’ve always assumed it was Paddies, plural, after all the Irish in the area but may well be wrong. In my day we catholic boys from Stockton took the number 11 bus to the RC grammar school in Linthorpe every morning, in my case from the stop on Bridge Road at the bottom of Parliament Street. I believe the grammar school girls took the ‘O’ bus into central Middlesbrough where Newlands Covent School was located, a long way from where we were so we never got to meet! The number eleven final rout was from Middlesbrough to Billingham via Mill Lane, Central Avenue, missing the Town Center and going up Melrose Avenue and terminating at the Telstar. The number 11 certainly went from the bottom end of Rievaulx Avenue in Billingham, i.e. near the Telstar, to Middlesbrough because in the early 60s I and a friend used to get it every Thursday night to go to the speedway. I even wrote a poem that included it! To watch the Boro Bears. There were several more verses, each one ending in ‘the Boro Bears’. I was 15. 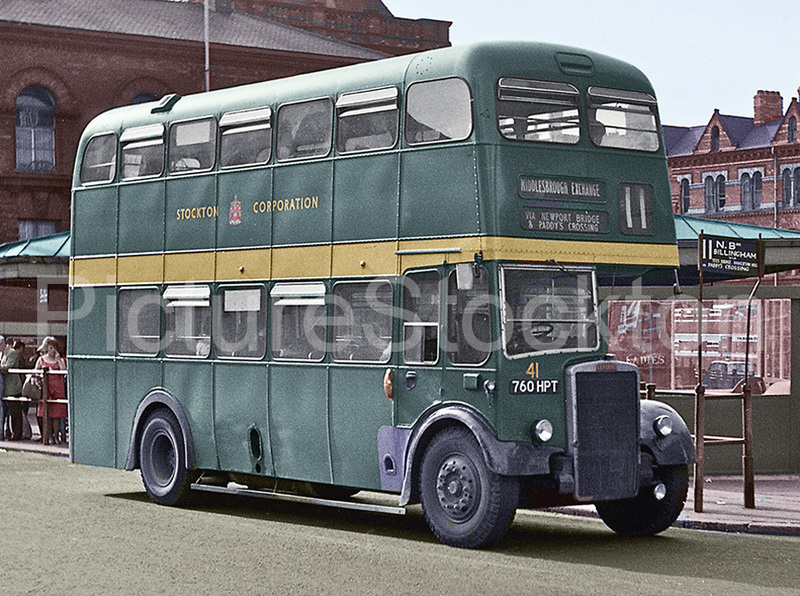 At some point Stockton Corporation buses changed from grass-green to a sort of bluey-green. I was a conductor on Stockton Corporation Transport during the 60s. The Eleven service was in fact split into two, one the North Bank service ran as the one depicted in the photograph. The other the ran from Stockton High Street through Thornaby via Thornaby Road, Lanehouse Road Acklam Road into Middlesbrough’s Mandale Road, to the Coronation onto Acklam Road to Cambridge Road making its way to the Exchange via Linthorpe Road. This bus didn’t for some reason travel onto Billingham even though both services had the same number. Philip, my dad was a Corporation bus driver around this time. Ernie Walton if you can remember him? He went on to be a crane driver.